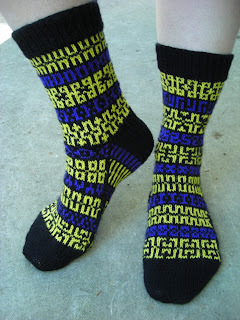 These are another pattern I just finished, called "Mix It Up Socks". The pattern and socks have been submitted to Knit Pick's Independent Designer program, and I'm waiting to hear back from them. If you've never checked out Knit Picks, you're missing out. They have tons of cool yarns and patterns, all of which are very reasonably priced. I've recently fallen in love with their sock yarns, which are wonderful to work with and come in a fantastic variety of colors.